I want to be one of my bridesmaids. I really do. I am so in love with their dress that I want to be standing next to them, wearing it too. Which, just might have to be an option, as I have yet to find a bridal gown and the wedding is just under two months away. Ok, good karma – good karma. This dress is absolutely beautiful and it looks smashing on all three of my girls. Best of all? 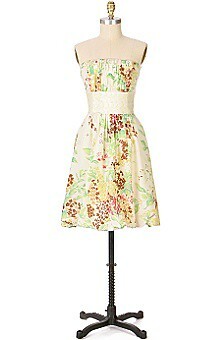 It is a lovely silk floral print dress they can really wear again. Not like some of the neon-colored taffeta monstrosities I have been forced to wear as a bridesmaid. No. This dress is meant to be worn more than once. Out in daylight even. Throw on some flats and you can go shopping in it. A pair of kitten heels and you have yourself a cute party dress. High heels and this frock will take you to a nice restaurant. Yes folks…this one is a keeper. Just like my three bridesmaids. All keepers. Watch out Mexico. Hot mamas en route.